Not the fastest, nor the most accurate, but easily the best overall. In 1963 the Browning Arms Company made history. The firm began chambering its Browning High Power rifle for the .22-250--a wildcat cartridge for which there was no commercial ammunition available. John T. Amber, reporting the development in the 1964 Gun Digest, called the event "unprecedented." "As far as I know," he wrote, "this is the first time a first-line arms-maker has offered a rifle chambered for a cartridge that it--or some other production ammunition maker--cannot supply." Amber foresaw difficulties for the company but "applauded Browning's courage in taking this step." He said he had his order in for one of the first heavy-barrel models--expected in June 1963--and added, "I can hardly wait!" That was 40 years ago, and ever since, as far as I can determine, there has been a Browning rifle of some type offered in .22-250. Two years after Browning broke the ice, Remington took the next big step. The company adopted the .22-250, added "Remington" to the name and offered it in its Model 700 along with a line of commercial ammunition. Overnight, it seemed, the .22-250 established itself as the dominant high-velocity .22. Winchester had just discontinued the .220 Swift and replaced it with the oddball .225 Winchester, a rimmed cartridge that was gone in less than a decade. Everyone ignored the .225 while falling over themselves to chamber the .22-250. Even Roy Weatherby got into the act. Until 1967 the Mark V rifle was available only in his own proprietary cartridges. That year, for anyone who did not like the cute little belted .224 Weatherby, he began offering the Mark V in .22-250 as well. Later, it would be chambered in the .30-06. For many years, it was the only other non-Weatherby cartridge to be accorded that honor. Today, .22-250s are as common as dandelions in May. Everyone who makes a varmint rifle offers it, and every ammunition maker has it in the lineup. It is the most successful centerfire .22 in history. Lovers of the .220 Swift can claim greater velocity (and rightly). Shooters of the .223 outnumber us, and benchresters are absolutely right when they say the .22 PPC is more accurate, measured in microns, shot after shot. So how, you ask, can the .22-250 lay claim to being the greatest small-bore cartridge of all time? Simple: Longevity. Flexibility. Popularity. It has more than sufficient velocity combined with excellent accuracy and a personality like a golden retriever. This is a wildcat that forced both rifle-makers and ammunition companies to sit up and take notice because it was just too good to ignore. Over the .22-250's lifetime--now approaching 75 years--other cartridges have come along, challenged it and fallen by the wayside while the .22-250 has just kept getting better. Over the years I have read many accounts of how the .22-250 came to be, and few of them agree. However, Philip B. Sharpe was around at the time and knew the principals involved. He was a fanatical rifleman and ballistician, and took an obsessive interest in anything to do with rifles. According to Sharpe, the initial work on the design was done by Capt. Grosvenor Wotkyns, a ballistician who worked as a consultant to Winchester. Wotkyns was one of the designers of the .22 Hornet, the original centerfire .22. In the mid-1930s there were very few factory smallbores around--the Hornet, .218 Bee and .219 Zipper. All had rims, and all left something to be desired in the new bolt-actions that were rapidly gaining favor. There was a frenzy of wildcatting going on, with cartridges being necked up, down and sideways as every rifle nut worthy of the name tried to come up with the ultimate .22. Most of these developments have long since been forgotten, justifiably so. Grove Wotkyns approached the problem scientifically with the goal of developing the best-balanced, most ballistically efficient .22 possible. While others played around with the .30-40 Krag or .30-06 case, Wotkyns settled on the medium-capacity .250-3000. There followed several years' work, experimenting to determine every aspect, from case taper to shoulder angle to neck length. Rifle after rifle was chambered, tested and discarded while Wotkyns made notes. According to the original plan, when development was completed the cartridge was to be adopted by Winchester as a factory round. At this point the facts become cloudy. Winchester did indeed introduce a high-velocity .22 in 1935 and even adopted the name Wotkyns had been using for his wildcat: the .220 Swift. But instead of the .250-3000 case, the new Swift was based on the 6mm Lee-Navy, modified somewhat for added strength and semirimmed. Why? No one knows. The records are lost, the principals are dead, memories are dimmed. Understandably infuriated--he later refused to discuss the Swift--Wotkyns continued work on his brainchild, drawing in a noted handloader, J. Bushnell Smith, and a gunsmith and shooting champion, Jerry Gebby. Together they perfected the ".22-250" design, developed loads, built rifles and even copyrighted a name for it: the .22 Varminter. That was in 1937. Phil Sharpe became involved when Gebby built him a rifle for the new cartridge. Since by this time Sharpe had been working with Winchester's new Swift for more than two years, he was in a good position to judge the relative merits of the two cartridges. The first thing he found was that the Varminter was far more flexible than the Swift. "[The Swift] performed best when it was loaded to approximately full velocity," he wrote, whereas, "The Varminter case permits the most flexible loading ever recorded with a single cartridge. It will handle all velocities from 1,500 up to 4,500 fps." Sharpe credited the steep 28-degree shoulder for this performance. He insisted that it kept the powder burning in the case rather than in the throat of the rifle, as well as prevented case stretching and neck thickening. "[Shoulder angle] ranks along with primer, powders, bullets, neck length, body taper, loading density and all those other features," he wrote. "The .22 Varminter seems to have a perfectly balanced combination of all desirable features and is not just an old cartridge pepped up with new powders." Accuracy was consistently excellent, with little need for either case trimming or neck reaming, and Sharpe pronounced it "my choice for the outstanding cartridge development of the past decade." He finished by saying he looked forward to the day when it would become a commercial cartridge. Alas, Sharpe--and everyone else--had a long wait. Because the name "Varminter" had been copyrighted, gunsmiths building rifles for the cartridge almost universally called it simply the .22-250, which is how it is generally known today. And in the ensuing quarter-century, many rifles were built with tiny chamber variations. There were all sorts of so-called improvements and little or no standardization. Again, this was partly because of the copyrighted name and dimensions of Wotkyns's .22 Varminter. World War II intervened, bringing cartridge development to a standstill for the better part of 10 years. It was several years after the war before rifles, ammunition and components became freely available once again. In 1950 Remington introduced the .222, a completely original cartridge with a new case that took the shooting world by storm. It exhibited none of the problems of the Swift; it was quiet and docile and extremely accurate. About this time, benchrest shooting became formalized, and the .222 dominated the game. Its major rival in the early years, however, was the wildcat .22-250, which at one time, according to Jack O'Connor, held most of the major benchrest records. With so much interest in the cartridge, why did it take so long for any ammunition maker, or rifle manufacturer, to make it legitimate? Part of the reason is that the .22-250 existed in so many minor variations, all called the same thing. This creates not only logistical problems but potential legal ones as well. In the 1964 Gun Digest, John Amber said that Browning was asking for trouble. Without standardized ammunition and loading dies, what would a Browning owner do if he was not a handloader or if he already owned a .22-250 with custom-made dies and the dimensions were not the same? As it turned out, there was no real problem at all. Fear that there would be, however, was the major obstacle for more than 25 years. 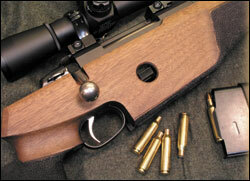 The .22-250's widespread popularity as a wildcat actually worked against it being adopted as a factory round. According to O'Connor, several companies sniffed around it, considering either chambering it or loading ammunition, before Browning took the bull by the horns in 1963 and announced a factory rifle. Once commercialized, the .22-250 became dominant, and with this dominance came a desire on the part of others to dethrone it. Claims that it could equal the .220 Swift are not true and never were. The .22-250 can do today what the Swift could do in 1935, but the Swift has become better with the introduction of better components, too, and its lead is still intact. Critics of the .22-250 said it was not as fast as the Swift, nor as accurate as the .22 PPC, and noisier and with more recoil than the .222. One writer claimed he found it boring because it was so consistent--an odd reason for disliking a cartridge when consistent performance is the holy grail of target shooters. Jack O'Connor tells an interesting story about the .22-250. "I once saw a loader dunk five Varminter cases into a can of No. 4350, fill them to the mouths, then seat 55-grain bullets on top of the powder and go out and shoot a one-inch group," he wrote. The cartridge is famous for its tolerance for variations in powder charges, in the powders themselves and in bullet weights. It will cheerfully shoot anything from a 35-grain bullet up to 60 grains. Phil Sharpe even gives a load using a 40-grain Hornet bullet and a light charge of bulk shotgun powder for an ultraquiet squirrel load. It was, he said, accurate enough for head shots out to a hundred yards. Every writer had his favorite load for the .22-250. O'Connor liked a 50-grain bullet with 36.5 grains of IMR 4320. "Velocity is about 3,700 fps, the accuracy sensational and the barrel life long," he wrote. There have been probably thousands of load combinations published over the years, for dozens of powders and hundreds of different bullets. For handloaders, therein lies a danger. Because the .22-250 began as a wildcat and was chambered with many minor variations, load data for one rifle may not translate safely for another. It is always a good idea to cross-check recommended loads from one manual to another, and that advice applies tenfold with the .22-250 when using loads from days gone by. As an experiment, I tried several of Sharpe's loads from the Complete Guide to Handloading. Checking his powder charges against current recommendations, I found several to be very hot indeed. Working up carefully, I encountered serious pressure signs and backed off before I reached the maximum Sharpe recommended. For the record, my own favorite .22-250 load for years was the 55-grain Nosler Ballistic Tip ahead of 35.7 grains of IMR 4064. Recently, I have achieved excellent results with the same bullet and Hodgdon Varget powder, and as soon as it becomes available, I will try working with Alliant's new Reloder 10x. The interesting thing I have found is that it is dead easy with any good rifle to get a load that shoots 3/4-inch groups, and consistent half-inch groups are not unusual. You can develop a load specifically for one rifle and find that it shoots equally well in a different rifle. This supports Sharpe's view that the .22-250 combined all the best elements of cartridge design to achieve superb balance. It is neither touchy nor temperamental. As the years have gone by and new powders, bullets and primers have come along, they have magnified the .22-250's virtues, just as they magnify the faults of certain other cartridges. The .22-250 is better today than it was 40 years ago largely because of advances in smokeless-powder technology. The .22-250 was born, coincidentally, within a year or two of the introduction of some of our best and most long-lived powders. DuPont's famous 3031 was introduced in 1934, and the very next year saw the arrival of 4320, 4198 and 4064. In 1940, 4350 came along to set a standard for slow-burning powders, and its burning rate is still used as the benchmark. For many years these were the powders most often quoted as delivering good velocity and excellent accuracy, with 4320 and 4064 leading the pack. Although it is a little slow-burning for the .22-250 case, IMR 4350 was useful for the heaviest bullets then available. Today there is a much wider array of bullet weights and configurations in .224 diameter, from 35 grains for the very lightest prairie-dog slugs up to 80 grains for long-range target bullets. As bullets have become more specialized, so have the powders to drive them. Hodgdon 414, which was introduced in 1967, quickly established a reputation for accuracy, and its spherical granules measured beautifully. For many, H414 became the workhorse powder in the .22-250. During the last decade or so, several new powders have arrived, aimed specifically at the accuracy market. H322 dominated benchrest shooting for years, in the .22 PPC and 6mm PPC, and powder makers searched hard for an equivalent for the larger-cased .22s. Hodgdon came out with Varget in the mid-'90s, later followed by Benchmark. Both are extruded powders, but Benchmark, with its tiny granules, meters especially well. This year Alliant (formerly Hercules) came out with its own entry, Reloder 10x. This is part of the wonderful Reloder line that includes RL5, RL9 and RL22. Reloder 10x is primarily a target powder (hence the name), intended to propel light bullets at high velocities with both accuracy and consistency. Finally, there are entries from smaller companies such as Vihtavuori and Norma, which is now back in the American market. No one powder will deliver pinpoint accuracy from every rifle, and certainly not with every bullet, but the extraordinary array of powders available today ensures that if a rifle is technically sound to begin with, a diligent handloader should be able to develop loads that are both fast and accurate. The revolution in bullet technology runs a close second to powder development in reshaping the capabilities of the .22-250. When the cartridge was introduced, handloaders were often forced to get bullets by pulling them from factory cartridges. Specialty bullets were almost unknown (Sisk bullets were one of the few available in .224, although Barnes was manufacturing larger calibers). Today virtually every serious handloader or benchrest shooter who has an interest can produce his own bullets and be assured they will be more consistent and accurate than anything available in 1935. The man most responsible for this is Dave Corbin, whose company has made bullet-swaging equipment readily available and affordable for even limited home use. This being the case, you would expect the array of factory and custom bullets to be overwhelming, and you would be right. Even so, there are a few especially good bullets that deserve a mention. First, the Nosler Ballistic Tip. Although nylon-tipped bullets are proliferating madly these days, the original Nosler took the shooting world by storm. Few remember it now, but nylon tips were actually pioneered back in the 1960s by the Canadian company CIL. CIL marketed Dominion ammunition loaded with "Sabre Tip" bullets of its own manufacture. During the 1980s, Nosler Ballistic Tips established a reputation for explosive terminal performance (not always a good thing) and superb accuracy. They were so accurate, in fact, that some shooters began using them as target bullets. They have never looked back. I have a couple of .22-250s that shoot Ballistic Tips better even than dedicated match bullets. If there is a better varmint bullet on the market, I have yet to see it.